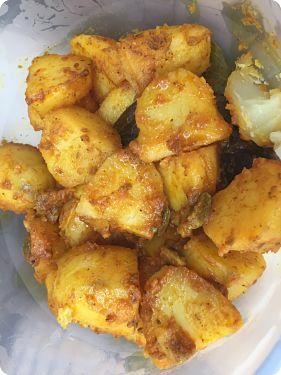 what I would call Zeera Aloo, will make really tasty Masala fries, deep fried crisp and dusted with a Chilli/Chat powder mix. which gives the Potato the look of sliced Mango when plated. Not to my taste, but Hey Ho. I’m not sure if this Video on pre cooking Potatoes is already posted on the forum, but I think it’s definitely worth adding to this discussion. Just about same method observed by JB in his takeaway. By co-incidence, I had my first-ever sag aloo at Mrs Bari's Golden Temple restaurant on Friday, and it was one of the nicest sag aloos I have ever had. The only spice I could positively identify was mustard seed, but when I asked Mrs Bari what other spices she had used she said she did not know. Apparently Mr Bari looks after all the roasting/grinding/blending, and she just uses what he makes. The other point that emerged was that demand for aloo-based dishes is sufficiently low that she does not prepare them in advance. Instead, she peeled the potatoes when I placed my order, cooked them in a pressure cooker, and then made the dish from scratch. So unless she uses spices in her pressure cooker (a possibility, of course) then it looks as if her recipe requires no special pre-cook at all, and all the flavour is added when the dish is made.